Happy Heart is a bold collection of wedding stationery, easily suited to a bright colour choice to really stand out from the crowd! All save the date cards are carefully handcrafted using 285gsm lustrous pearlescent card and finished with elegant satin ribbon. 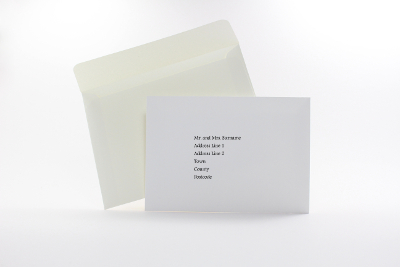 They are printed with your chosen wording and are fully personalised. All our wedding stationery is available in a wide range of card and ribbon colours to complement your wedding theme. A choice of embellishments are also available for the Happy Heart collection. 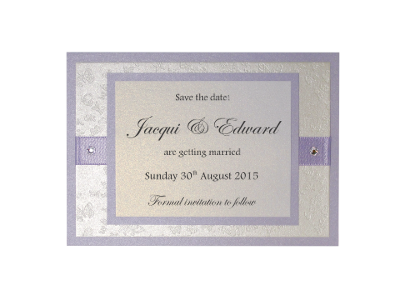 The save the date example shown is made using Kunzite, Cream Butterfly Embossed and Dolominte pearlescent card. The featured Orchid satin ribbon includes a pair of Swarovski crystals to complete the style. and to order using product code STD12.